Jakarta Water Resources (SDA) Department tests Seawater Reverse Osmosis (SWRO) water quality and water supply network's pressure in three inhabited islands: Kelapa Dua Island, Payung Island, and Pramuka Island of Thousand Islands. "This test purpose is to see the pressure from electric water supply network and water quality in residential houses"
"This test's purpose is to see the pressure from electric water supply network and water quality in residential houses," mentioned Jakarta SDA Dept. 's Raw and Clean Water Improvement and Development Section Head, Aditya Putra Brata while monitoring in North Thousand Islands, Thursday (1/10). 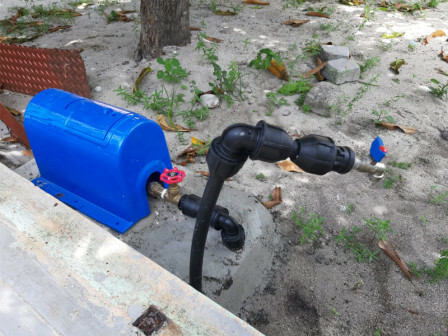 From total target 1,000 residential houses in Thousand Islands, his side has installed clean water device and connected it to 954 houses. In detail, it has been installed in 274 houses in Pramuka Islands, 520 houses in Panggang Island, 111 houses in Kelapa Dua Island, and 49 houses in Payung Island. Panggang Island hasn't been tested yet because its installation is not fully completed. "Our target is to complete installation in Panggang Island this month, so we can test it immediately," he conveyed.